Canada geese. It's not just a problem of too many geese, but a problem of geese in the wrong locations—on golf courses, business parks, in public parks, and on school sports fields. Each adult goose produces 1 to 1 1/2 pounds of droppings per day. These droppings aren't just something we don't like to step in. Quantities of goose droppings are detrimental to the grass itself, and any bodies of water they are washed into, causing algi bloom. Chemicals can be toxic to the environment or nontarget species and some are not biodegradable. and most need frequent re-aplications. After losing our family dog to cancer, the number of geese on our property increased 10 fold. We have open space and two ponds adjacent to our property so we are easy pickings for food for geese. In 2007, we had young grandchildren who would come to play and I began to wonder if the goose droppings were diseased as it was virtually impossible to keep the grandchildren from walking in the droppings droppings deposited in great quantities each day. In March of 2007, I was losing the battle of keeping the driveway clean for a women’s luncheon and each morning for two weeks, I would run after the geese, clean the driveway, and the start over the next day. The day before the luncheon I was in the driveway running after geese, slipped on a patch of ice, and ended up with a concussion, a dislocated shoulder, and a bruised body. At our wits end we decide to get another dog, which would be such an injustice for a dog as we were now traveling so much. On the way to the Dumb Friend’s League, I saw the Hardey Border Collie Goose Patrol (now Goose Dog Mama), SUV at St. Mary’s Academy and the dogs were chasing the geese on the athletic field. I took the phone number from the SUV, turned around, went home and called them. Terry and the Border Collies have saved my body and my sanity. I often see the dogs at work from my kitchen window and they absolutely cause the geese no harm. The minutiae the dogs come out of the car, the geese are in-flight. Without qualification, I would recommend Hardey Border Collie Goose Patrol to anyone who is looking to control geese on their property. Heather Gardens is a retirement community with a 9 hole golf course. As with many golf courses in Colorado, migratory Canada Geese have a negative impact on valuable property. Before hiring Terry Hardey and Colorado Goose Dog Moma, Inc, we tried several deterrents such as chemical repellants, stringing over the lakes, and artificial swans. None of our efforts was effective. Our forty acre property, including a mile of paved cart path was covered with geese droppings. The geese would also chew holes in the greens. The geese problem was unacceptable to our golfers and residents. Since 2004, Terry and her dogs have been working at Heather Gardens with consistent effective results. The amount of droppings, and the amount of turf damage was drastically reduced because the number of geese and the duration in which they stay on property have been reduced. No geese have been killed or injured by the dogs. The dogs are well trained and well behaved. 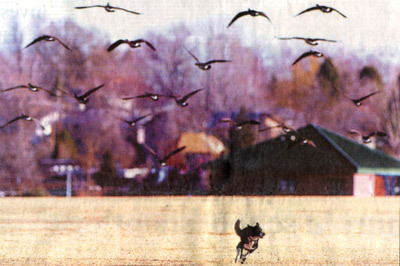 Using trained dogs to combat the geese problem has been the most effective method in deterring the geese in a safe and legal manner. Fawn encourages Canada Geese to leave a Denver Metro Park.